A Little Bolt of Life: Liebster Nominations! I was VERY flattered this morning to wake up to a LEIBSTER AWARD nomintation from the lovely ladies over at Vanilla and Lime! How exciting! 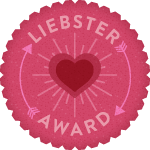 What is a Liebster award you ask? Well I was wondering the same thing! It's a German word meaning: sweet, kind, nice, dear, beloved, lovely, valued and welcome. Answer 11 questions the tagger has asked you, and give 11 questions to the people you’ve tagged. Choose 11 deserving bloggers and tag them in your post. Tell them you’ve tagged them. I worked in Disney World for a semester in college at Disney's Hollywood Studios. I was a hostess at Hollywood and Vine. I am obsessed with Lilly Pulitzer! My husband and I got engaged AND married in Disney World! My dad was in the Navy so I moved around a lot as child, but surprisingly enough, we moved back to VA 3 times! 1. What's the clumsiest/silliest thing you've ever done? I worked at a restaurant that had just opened, so you can imagine how crowded it was on the first weekend! The kitchen was backed up and so tables were waiting 30 min or more for their food! One particular table was a nice family of four who looked like they had been waiting for forever! I was not their server, but wanted to help out so I saw their pizza was ready and took it upon myself to run it out to them. Literally just 1 foot from their table, I lost grip of the pizza and down it went!! This poor family was forced to watch their dinner fall to the ground right in fron of their eyes! You should have seen their faces. I felt awful. We of course, got another pizza in the oven as soon as possible and all was well. That was the first time, but defintely not the last time my clumsiness got the better of me when working in the food industry. 2. What's your favourite smell? I am super weird and like the smell of different types of paper. Money (who doesn't love that smell?!) and fancy brochures to name a few. I'm not going to go any further for fear of coming across strange. Chocolate! I love anything and everything chocolate. Don't get me wrong, vanilla is a definite close second. But I realized when I have vanilla, there is chocolate mixed in there somehow. I can't stay away from chocolate! 4. Can you tell us a funny joke? Pretty please. We love jokes. I am the WORST at jokes. The only way I could tell you a funny joke would be if I cheated and looked one up online. I didn't want to do that and give you a false perception that I am witty and funny. I'm not boring...I'm just one of those people who say/do witty things on accident. 5. Do you like candles as much as we do? What's your favorite candle? Oh man, do I LOVE candles! I have a stockpile (much like you!) I used to work at Yankee Candle just so I could get a discount on what I spent all my money on in college! If I had to pick one candle that I always go back to, it would have to be Lemon Lavender. It never gets old to me! 6. Chevron or Polka Dots? I'm definitely a Polka Dot girl. Chevron is so hot right now, but polka dots NEVER go out of style. It's a timeless classic. I would love to be invisible! Not because I'm shy and don't want people to see me, but because I am so curious nosey to learn about how people are in "real" life. I am part of the minority that dislikes both! I am a Diet Coke fan through and through. DISNEY! DISNEY! DISNEY! I love going to Disney multiple times a year. My husband and I can't get enough of the parks. We listen to park music from attractions and rides between trips. It's definitely our "happy place". I would love to be able to stay at home and craft, decorate, and clean! I love the sense of accomplishment I get from doing those things. Plus it would mean I would never have to get out of my PJ's! And NOW I will tell you the 11 blogs I've nominated for this special award! Here are the 11 questions YOU get to answer! Enjoy! Falling asleep at night, do you need absolute dark and silence? Or do you like a little light or the TV on? What is your go-to dinner when you've had a long day? If you got handed 5 million dollars tomorrow, what would be the first thing you would do with it? Are you a planner? Or a fly-by-the-seat-of-your-pants kinda girl? Now that you know ME a little better, let me get to know YOU! I look forward to reading your answers! you are so sweet girl! thank you so much! <3 <3 loved reading your answers! you know i love me some Lilly, too! I'm laughing so much here, you're hilarious. They're some great answers!!! Lemon Lavender is one Yankee Candle I do not like, are you shocked? Lol. I tried it only a while ago because I had heard it's one of their best sellers, but I didn't like it at all.